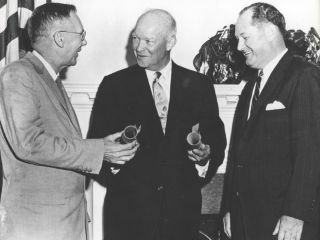 President Eisenhower commissioned Dr. T. Keith Glennan, right, as the first administrator for NASA and Dr. Hugh L. Dryden as deputy administrator. The National Aeronautics and Space Act (Pub.L. 85-568), the United States federal statute that created NASA, was signed into law 50 years ago today on July 29, 1958. Fifty-five years ago today, a space agency was born. Today, it might be easy to think that the best years of NASA and the American space program are in the past. NASA has been to the moon, been there and done that, and its budget now is nowhere near what it was in the Apollo moon mission heyday. But it seems to me that NASA has a much different role now than in the '50s and '60s. The Soviet Union is gone, Russia is a welcome partner and there is an International Space Station the size of a football field in space with six people living on it, right now. I can see it from my porch on good nights. Today, NASA is partnering with private space companies and aiming for deep-space travel beyond the moon. Whether NASA ultimately makes it back to the moon, snags an asteroid and parks it near the moon, or lands people on Mars — which sci-fi fans have really been waiting for—one thing is clear: I don't think we're going to want to miss the next 55 years. So Happy 55th Birthday, NASA, and here's looking at the next 100.